Every one of us has had an experience of our car battery dying on us just as we are on our way to an important meeting and then we are stuck on the side of the road praying for a helpful fellow motorist or roadside assistance to arrive. Or maybe you live in one of the northern states where every winter you have trouble starting your car in the morning. You need a portable jump starter. This article helps you select the best jump starter for you. 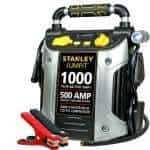 Some of the top-rated jump starters on Amazon.com are Jump-N-Carry JNC660, PowerAll PBJS12000R, HyperPS 20000mah Multi-Function and Stanley J5C09. A jump starter is an emergency device which means it needs to work every time it is needed. So it is important to remember to buy a jump starter because it is reliable and capable and not for all the bells and whistles attached to it. That is the reason, in this article, we will be concentrating on those features which make for a good jump starter and not on any additional features. Battery: The most important part of any battery powered jump starter is the battery. First, check the battery in your vehicle. The most common modern vehicle battery is a 12V one. The second part is the starting power delivered by the battery, the higher the peak and cranking amps, the more power delivered; hence faster your vehicle battery gets charged. Also larger vehicles especially SUVs need more power. For the best results look for jump starters with batteries with 900+amps of peak power and 225+amps of cranking power. 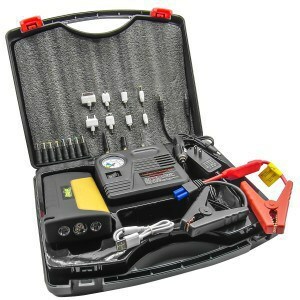 Cable & Clamps: These are connected from the jump starter to your vehicle. Ensure you have a heavy duty cable which is a minimum of 3 feet long as this gives you flexibility in placing the jump starter. Also, the clamps need to be heavy duty so that they can conduct electricity in any weather condition and any battery state. Recharge Mechanism: The jump starter should be easy to recharge. Look at safety features of the device for longer battery life. Others: The device should be portable and should fit into the trunk or inside your vehicle. Also, pay attention to the terms and conditions of the warranty. The jump starter should also be easy to use. Most importantly decide what is the amount you are willing to spend for the jump starter. Finally read the user manual, speak to a few auto experts at your local garage and read reviews online before purchasing one. To better understand which of the above is the right one for you; let us take a look at their detailed reviews. The Jump-N-Carry JNC660 is a professional grade jump starter that has been designed for use automotive services, auto dealerships, etc. A product of Clore Automotive, which has over 50 years of experience in designing and developing after-market products for the automotive sector. The Jump-N-Carry JNC660 is a powerful professional-grade jump starter which has one of the highest peaks starting power of 1700amps. It is powered by the JNC105 Clore PROFORMER battery which has been specially designed for vehicle jump starting. It can be used to jump-start any vehicle with a 12V battery including a 1ton pickup. Once charged it holds the charge for a long time and can be used to jump-start several times before needing to be charged again. This why it is liked by automotive professionals. The JNC660 is a pure jump starter, i.e. it does not have any other feature that many other jump starters have like air compressors, etc. It is very simple to use. Just attach the cables to the car battery and it gets charged. It has a 46″ long, heavy-gauge cables which can be used to attach the starter to any vehicle. It has a battery-status gauge which lets you check the status of your battery before charging. It has a built-in charger which can be connected to an extension cord for charging. With dimensions of 16.3×14.1×5.1inches, it is small enough to fit into your trunk. With a weight of 18 pounds and a handle which can be used to carry it, it is extremely portable. 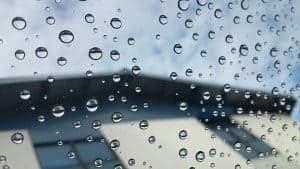 Check out our reviews on the best car air fresheners. The battery has an in built monitor which prevents the battery from overcharging and thereby increases its life. The unit comes with a unique warranty. It comes with a 1 year full warranty and a repair service coupon which can be used any time after the first year for a one-time repair of the unit with a fixed value. 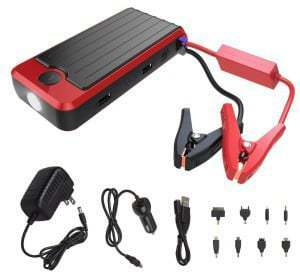 High Quality, high-performance jump starter with 1700amps of starting power. No other features like air-compressor etc. 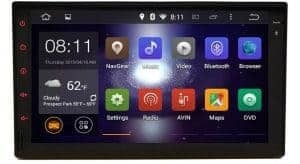 It is available at most stores which sell after-market car accessories but for great deals go online to sites like amazon.com. It is more expensive than some other products, but if you want a good and dependable professional jump starter this is the one for you. 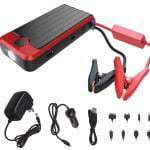 A 3-in-1 portable car jump starter, the PowerAll PBJS12000R Rosso is a jump starter, a power bank, and a flashlight all rolled into one device. Package includes all major charger adapters. The PowerAll PBJS12000R has peak starting power of 400amps. This means it is great for small cars but cannot jump start some SUVs and pickups. It can jump-start a car 20 times on a full charge. Once charged, the battery can sit for a long time before recharging again. It is a portable power bank which can charge 2 devices at a time using the 2 5V/2.1A USB ports. The flashlight has 3 modes LED flashlight, strobe light, and SOS light. The battery will last for 120hours of use as a flashlight. A portable device with dimensions of 6.5×2.9×1.2inches and weighing 1pounds, it will fit into any backpack or glove compartment. It is made of durable plastic and rubber. The device has a lot of built-in safety features like over-current protection, overload protection; over-voltage protection; over-charge protection and short-circuit protection which improves battery life. A 3-in-1 device for all around charging. Cannot jump start bigger and heavier cars including some SUVs. It is available at most stores which sell car accessories and power banks, but for best deals head to amazon.com. It is a good value for money product. The HyperPS 20000mAh is a road emergency survival kit. Along with the Jump starter which also functions as a portable power bank, you get a 150psi air compressor, a hammer, survival blade and an LED light which can also function as an emergency strobe light. The HyperPS 20000mAh has a jump starter battery which has a peak starting power of 600amps. It has one of the highest capacity lithium batteries – 20000mAh. The battery charges quickly and supports low discharge. It supports 12V, 16V, and 19V output pins. Charging the battery can take you up to 19 hours. It comes with 12” jumper cables which are short if you want to place the jump starter battery down on any other surface during charging. It comes with a 150 psi plastic air compressor which can be used for 8 minutes at a time to inflate your tires to the required pressure. Looking for the best impact wrench? See our reviews. Many reviewers have questioned the quality of the product and its durability; others have praised its quality material and construction. Also, no information has been put out by the manufacturer from China on warranty. The battery can charge larger vehicles but not really large SUVs and pickup trucks. It is available for a great price on amazon.com. It is also available at most after-market car accessories stores and electronic stores. The Stanley J5C09 is a product from the company Stanley which is known for the quality of their products which are dependable. 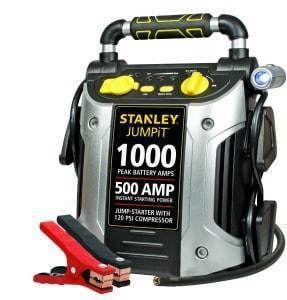 The Stanley J5C09 is a powerful jump starter with a peak starting power of 1000 Peak Amps and a 500 instant start amp. Though not as powerful as the JNC660, it is adequate to jumpstart most cars on the road today. It also has a loud reverse polarity alarm which warns you if you have placed the jumper clamps in the wrong position. It is simple to use. It comes with heavy duty metal clamps and thick jumper cables. With dimensions of 11.2x8x13.5inches, it will fit into the trunk of any car. 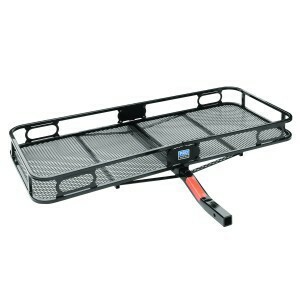 It has a weight of 18 18pounds and has a top mounted rubber handle which makes it easy to carry around. It has a USB port which can be used to charge laptops and other mobile devices. It also comes with a 120 psi air compressor for any tire-related road emergencies. This is a Stanley product which means it has good quality and durability. The battery, however, does not have an overcharge protection which can reduce the life of the battery. Lack of overcharge protection for the battery. Non-returnable policy as it is considered a hazmat item. Available at most car accessories shops and online on sites like amazon.com; it is one of the cheapest jump starters. 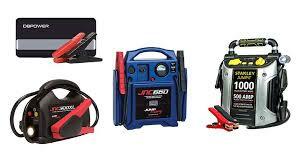 The article gives you an idea of the different types of jump starters in the market. 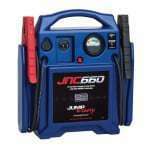 But for me, Jump-N-Carry JNC660 is the best jump starter for a professional or a home consumer. For one it has the power for a wide range of cars, which means when you upgrade or buy a bigger car, you don’t have to upgrade your jump starter. It is a professional grade starter which ensures both quality and reliability. Finally, I like the fact that it is a pure jump starter which means I do not waste its battery for other uses and have a low battery when I need it in an emergency.